Everyone on the road has seen signs for weigh stations, often signaling for truckers to stop when the lights are flashing. Stopping at a weigh station is required for trucks, as it is a stop where the Department of Transportation (DOT) inspects the weight of a vehicle to ensure truckers are traveling with a safe load. In addition to following weight regulations, there are many more reasons why commercial trucks should always be weighed. Trucks are extremely large and heavy vehicles, and when operated incorrectly, they can be very dangerous to others on the road. Cargo trucks are required to maintain a load that is within certain capacities of the truck they are operating for safety reasons. If a truck is overloaded and is too heavy, truckers don’t have enough control of the vehicle, and making turns, going downhill, or even driving too close to cars can result in horrible situations. Roads and interstates also have a maximum weight they can handle, and which mainly applies to cargo vehicles. While the weight limit varies depending on the state, there is a federal law in place that trucks must weigh less than 80,000 pounds. Weigh stations are an efficient way to ensure all trucks on the road are carrying a safe amount of weight and don’t pose a threat to other drivers. Truckers must also stop at weigh stations to calculate the taxes on their truck. Carriers pay a lot of money in taxes to put the stress of truck on the roads, and it is calculated by the load weight. These taxes go toward maintaining transportation, including roads and bridges. 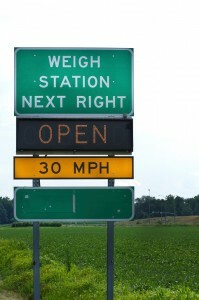 If a truck stops at a weigh station and is carrying more than the weight restriction, they have a few options. They can either split their load, or apply for an overweight exception permit at the station before going back on the road. Neither of these options is ideal, so it’s crucial for carriers to know their weights prior to leaving on a haul to avoid any problems or delays. For business owners, the most important reason to have trucks weighed is profitability. The value of goods often depends on weight, and operations managers must know the weight of every load that is shipped and received to ensure fair trade. Inaccurate weight measurements can cost a company a lot of money, so weigh stations play an essential role for business owners. This entry was posted on Thursday, November 29th, 2018 at 9:10 pm	and is filed under Weigh Stations. You can follow any responses to this entry through the RSS 2.0 feed. Both comments and pings are currently closed.